I started with #4 yesterday, on the same model as number 3. 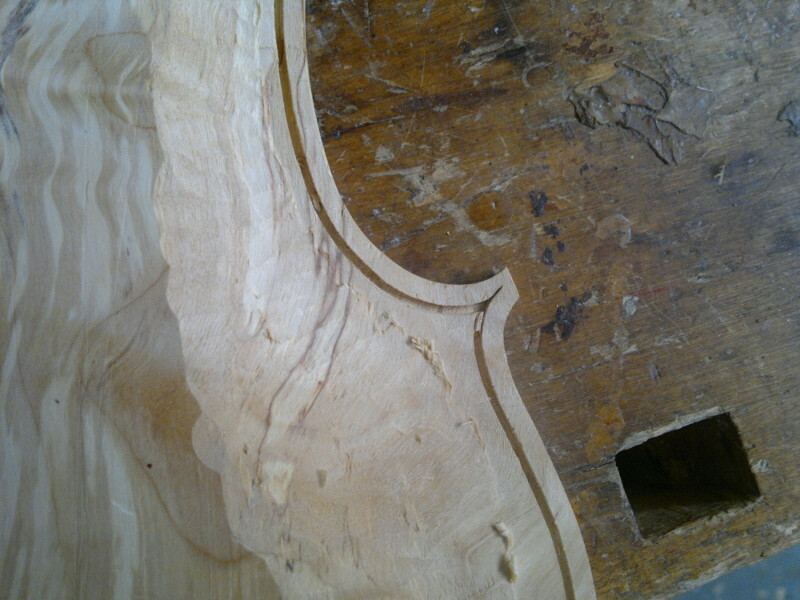 On #3 I used low density spruce, this is a much heavier top. 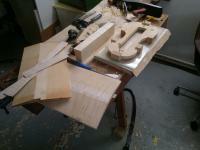 Love that corner block sander! For the end blocks, I use this on a table saw... cheap, and precise and because the table saw top is bigger than most other sanding machines, you can more confidently control the mold/blocks as you work. Thanks for the tip actonern. 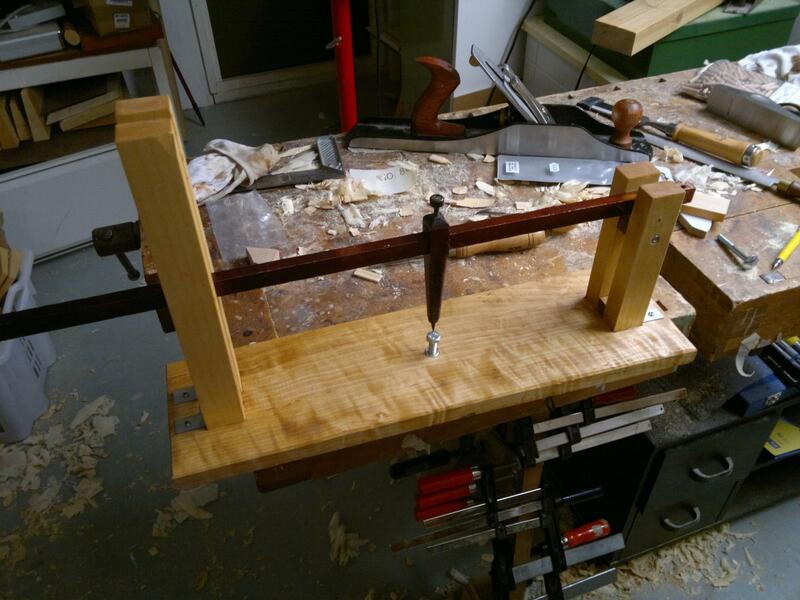 I don't own a table saw but would like to have something better for the endblocks, it is not easy to get smooth curve there with my setup. 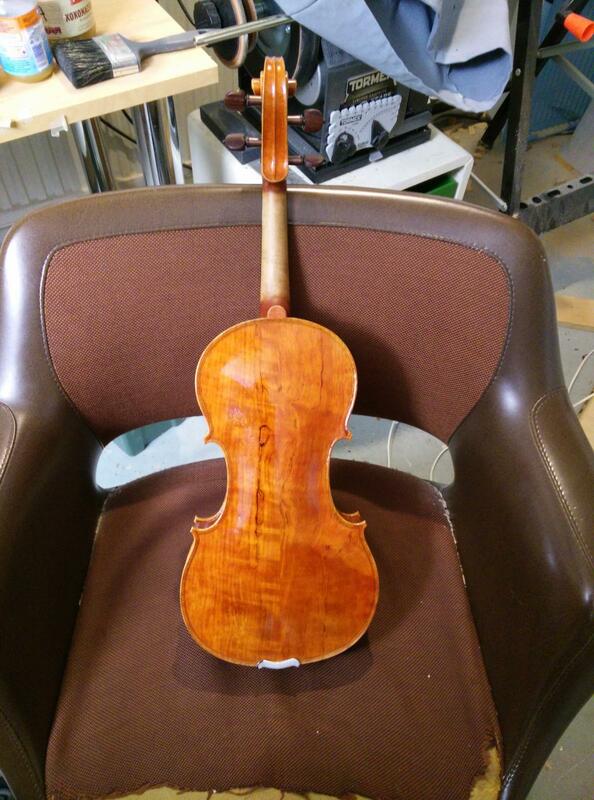 It's a long time since i posted but the violin is finished now, so I thought i'd post some pictures. 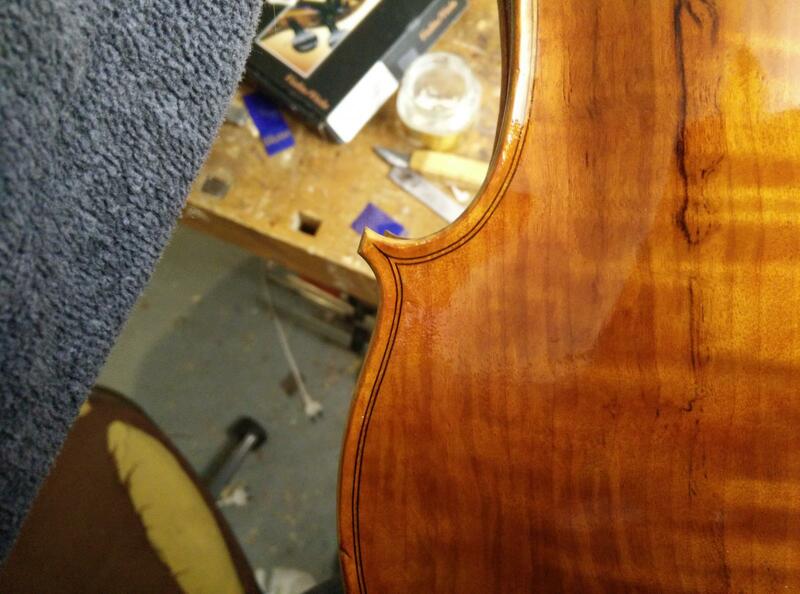 I love the varnish. What are you willing to share about it? Thank you John. I used Joe Robsons products. I tried to get a dark base with tea and a short fuming with ammonia. Then sodium nitrite and UV. After that I used Joes ground system with aged wood color gold. 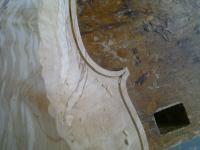 Then greek pitch brown varnish with a little dark rose color concentrate. 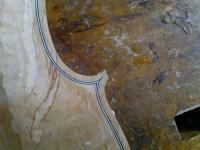 Fjodor, the purfling detail is great and the varnish looks very good indeed. Since you can do the handwork to a high standard, you need not use many machines, it only complicates things in the end. Plus, people will always appreciate hand skills. Is this you? 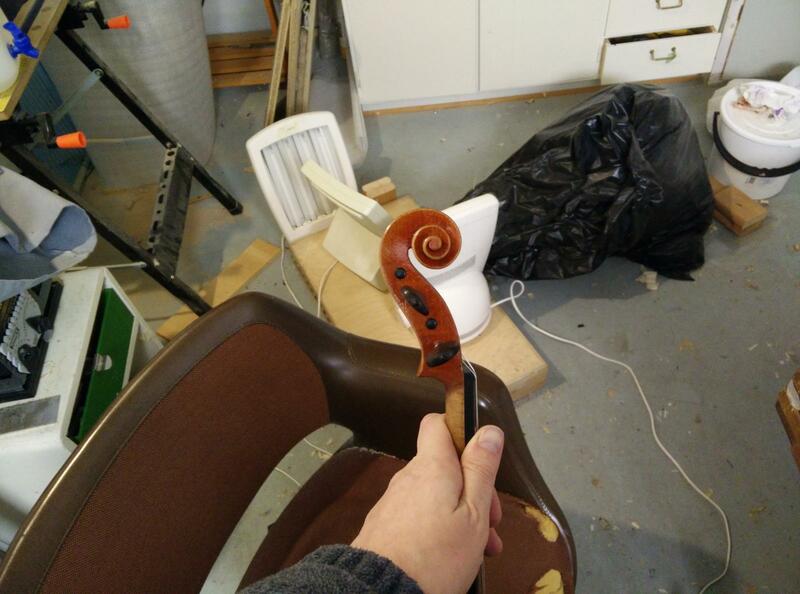 I looked at some of your photos of violins and flowers. You know what you are doing with light. 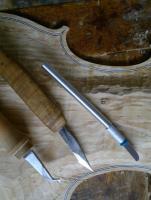 I don't use many power tools, and prefer to do things by hand. I was thought to finish the corner blocks with a sanding drum in a drill press and tried to make something similar. 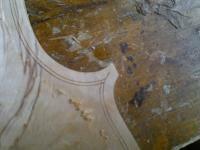 The sanding goes so slowly so there is no risk of ruining things. This graduation punch was completed today. 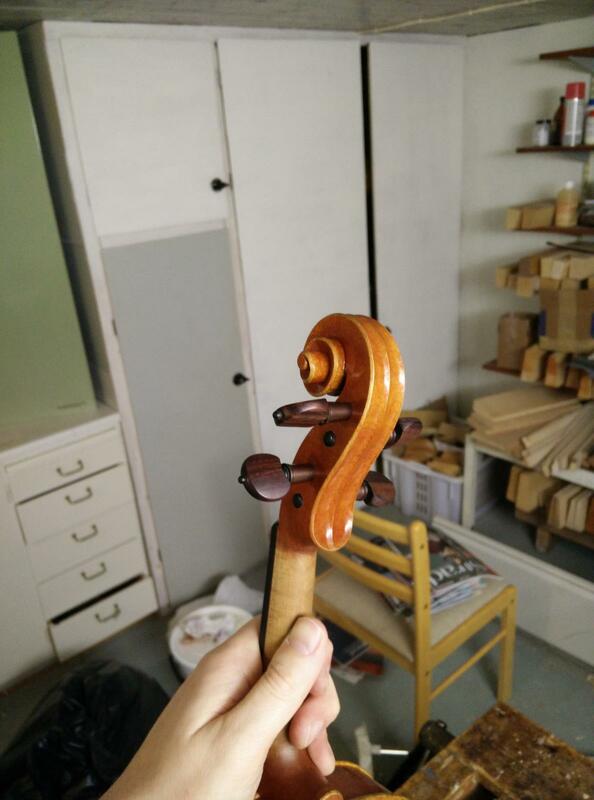 It used a leftover birch board with nice figure as a base and finished it with tung oil. I took some pictures while doing the purfling in the corners on backplate I'm working on. Mark the purfling channel with the marking tool and extend it a bit in the corner for a "bee-sting"
Glue in the c-bout purfling as this and leve it to dry. 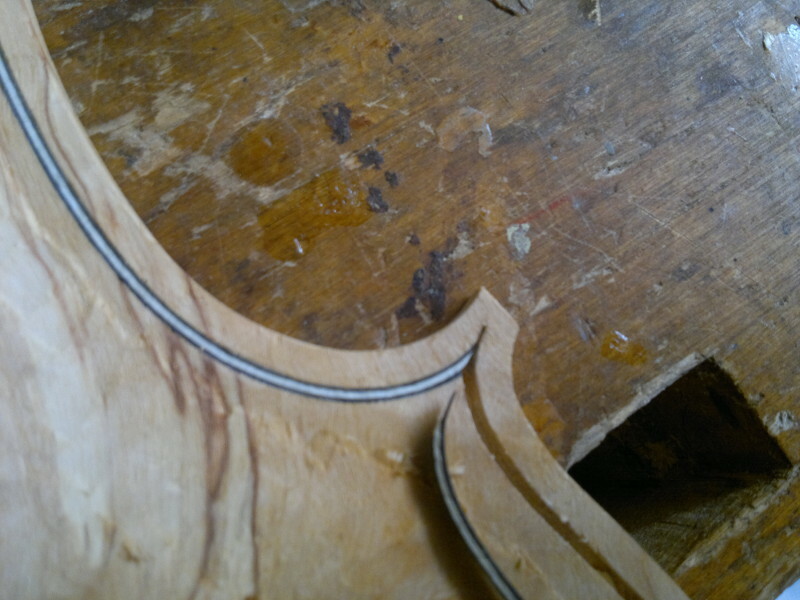 I leave a bit wood in the outer bout groove to help prevent hurting the corner "triangle"
Then cut away half of the c-bout purfling in the corner, bend and try to fit the outer pufling strip as good as possible. How old is the birch and how does it "feel" compared to the maple of your last one. 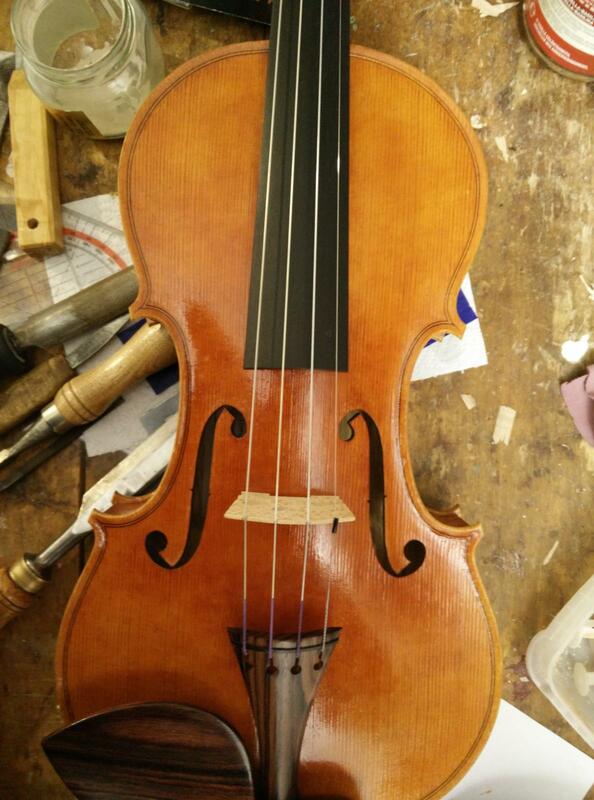 One of LK's first violins, with birch back, beat mine with two placements in Sibelius violin making sound contest (a long time ago). 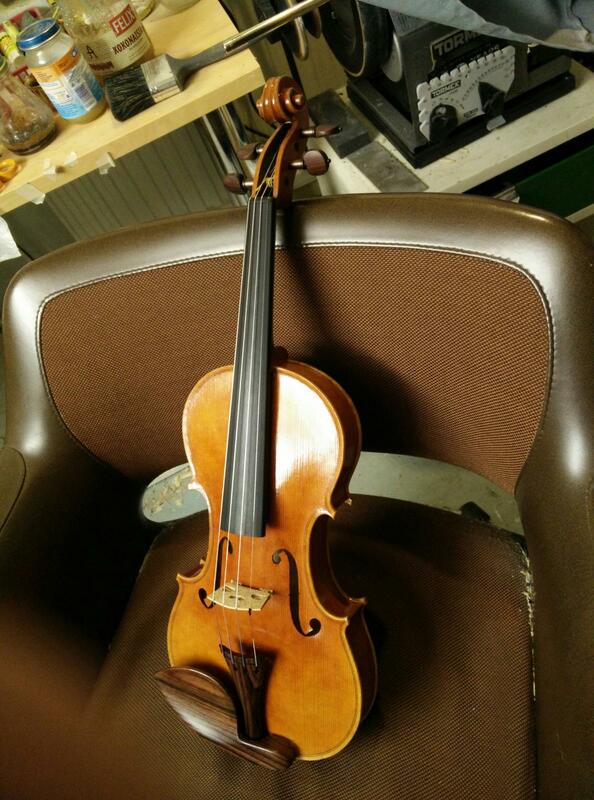 This was also one of the violins that stod out for more playing because it had a special sound, espacially on E string. LK and I was there when they played this violin a couple of times. It had very clean carrying higher notes, with lots of overtones. 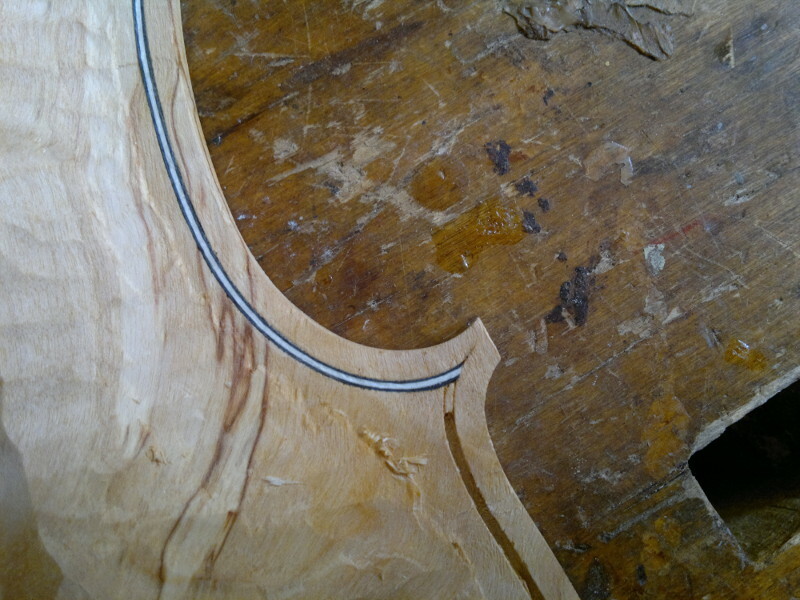 I have linked this particular sound also to one of curious1's violins with very high density back. is a bit more prone to split along the grain when working it, so one has to be careful. I have several birch back fiddles (and made one my self) and they are all very different from each other, so I can't say there is some special quality to it. 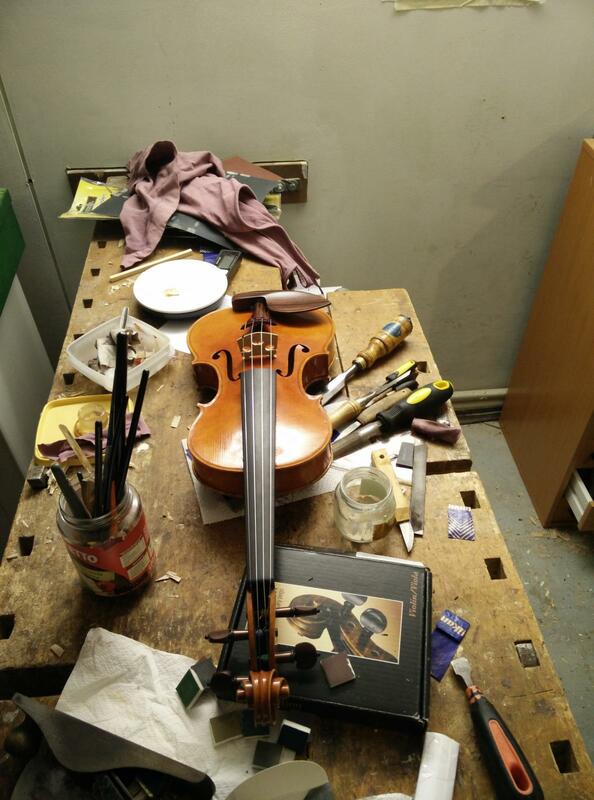 Personally i think the spruce and the model of the violin makes more difference. Here are some more pictures. 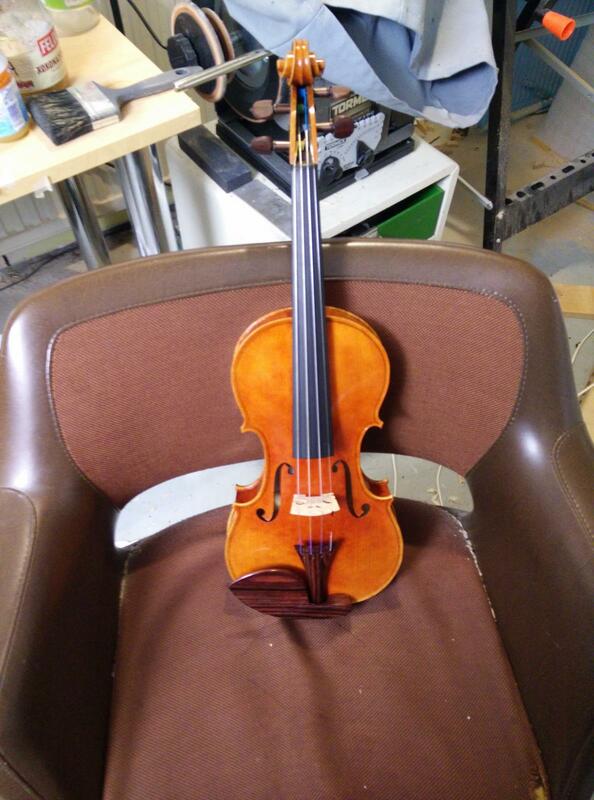 It is my fifth violin. Great work with the scroll. 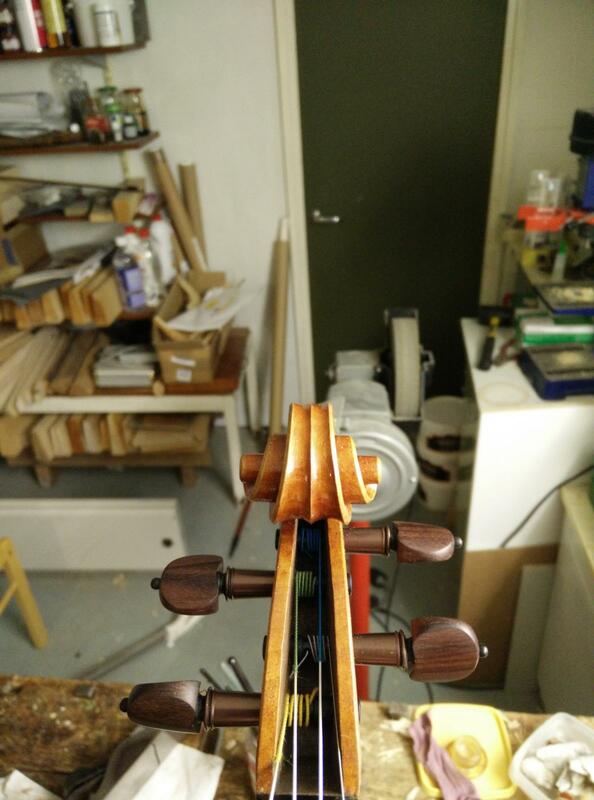 The varnishing job is also outstanding, it looks like it's not too thick and yet full of colors. 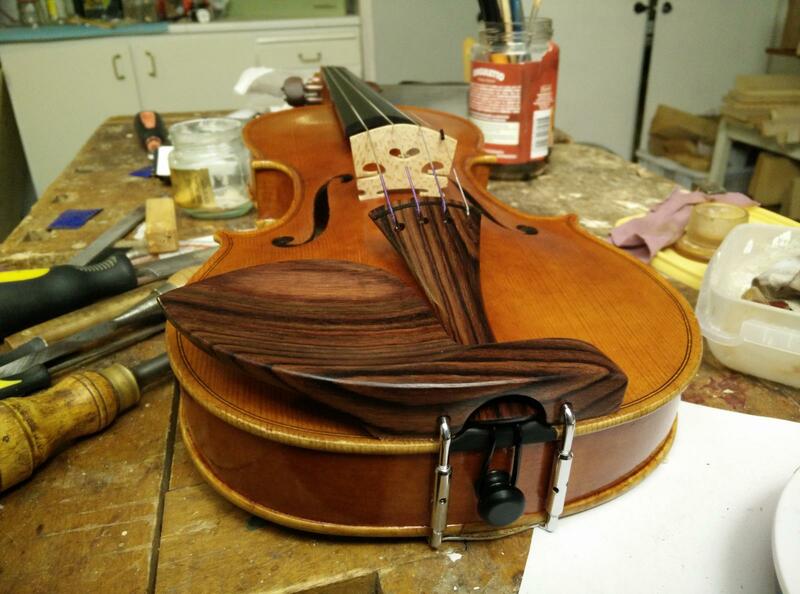 The whole violin is really nice. Fjodor, That is really sweet. I like the model outline, what is it? It certainly isn't frumpy. I don't like frumpy looking violins. I used birch on one, and it is the most clear sounding of any that I've made. It had deep flames in it that you had to watch out for, and the ring tone was a little lower; but topped with a low density top it seemed to work. Nice scroll too. I haven't figured that part out yet. 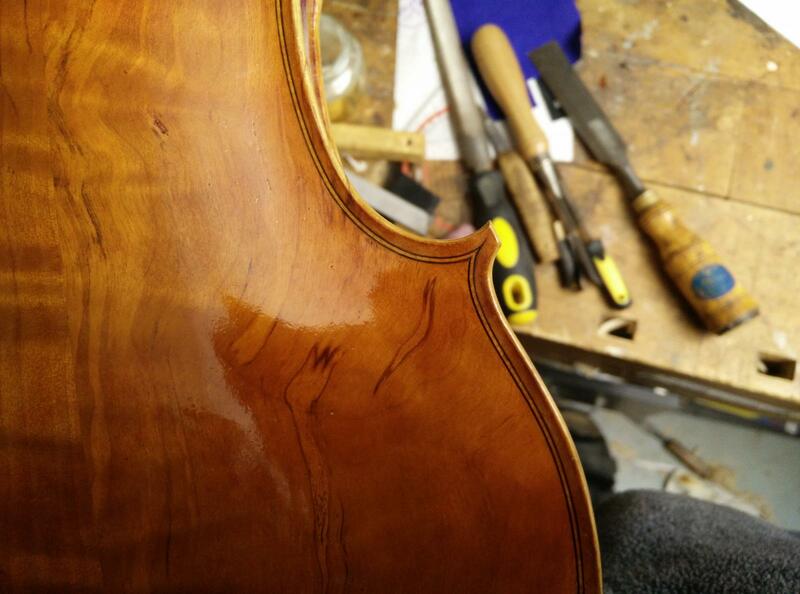 We have to meet some time and play and compare the violins when you get yours finished. 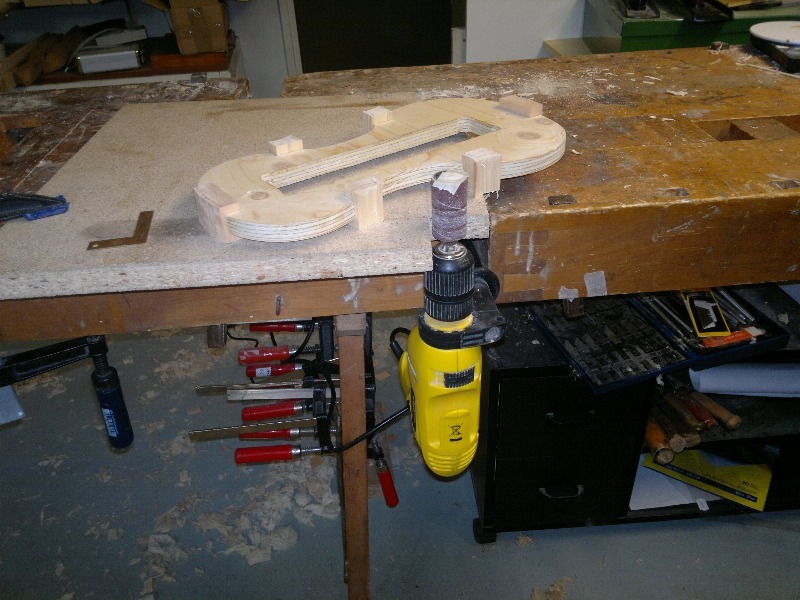 Thanks Ken, This is my own small model that I made when i had some nice wood with small dimensions. I have made 3 of them now and tried a bit of different things. I also find birch works fine for the back. Higher density spruce seems to work best for me so far..
300 Hz is low, but on the other hand if you like the violin it doesn't mean anything. Have LK to show you next time you visit him.